Welcome to the Crazy Crafters' Blog Hop with our Special Guest stamper, Jessica Brigden - we are thrilled to have Jessica join us this month and so excited to CASE (Copy And Selectively Edit) any project that has been created by her. 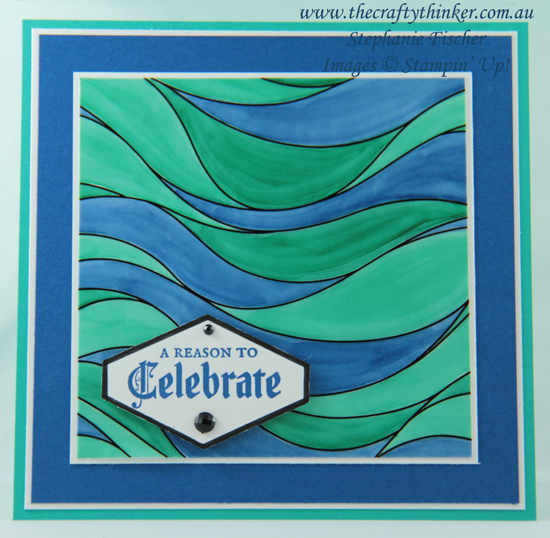 I was inspired by Jessica's layering, use of the Tailored Tag but mostly by the way she coloured in Designer Series Paper to create her card fronts. 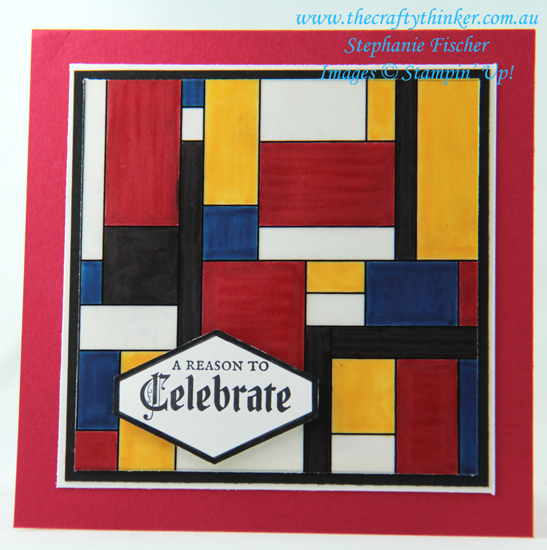 Those who have been following my blog for a while will know that I'm a great fan of the work of Piet Mondrian which has inspired several of my cards. 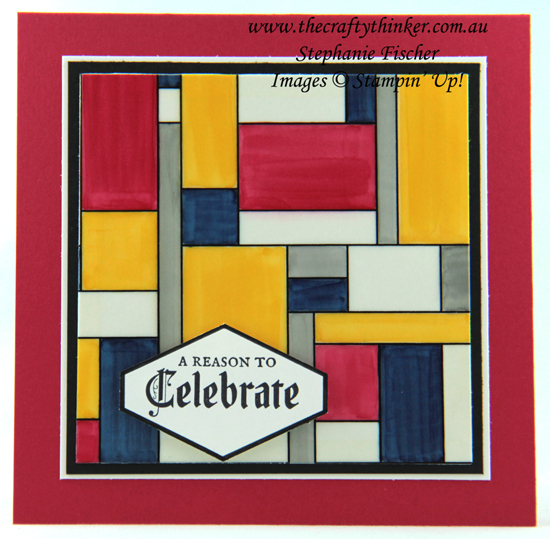 As soon as I saw this pattern in the gorgeous Graceful Glass Designer Vellum pack, I just knew that I'd be creating some more Mondrian-esque cards with it! I coloured this first card with Stampin' Blends alcohol markers. I really like the way they dry so well and quite quickly on the vellum and any mistakes were really easy to correct. The only drawback was the lack of a black marker. I used the Dark Smoky Slate and it makes a very pleasing pattern but a real Modrian look requires primary colours and black! The greeting is from the coordinating Painted Glass stamp set which I cut out with the Tailored Tag punch. The black edging is created with a black Stampin' Write Marker and a ruler. Use this method with any of the Stampin' Write Markers that match the cardstock or ink in your project - one of the many benefits of the Stampin' Up coordinating colours! Craving that black, I decided to make another version using Stampin' Write Markers. The only drawbacks were that the ink took a long time to dry and any mistakes or "bleeding" could not be corrected. The cardstock layers are Real Red, Whisper White and Basic Black. TIP: For a deeper, bolder colour tone - colour both sides of the vellum. 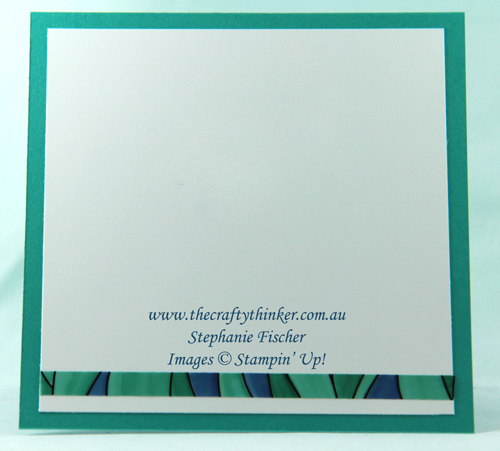 TIP: Adhering the coloured vellum to a similar sized piece of Whisper White cardstock will show off the true colours. Areas left uncoloured will appear white. Strength of colour will vary depending on how you apply it to the vellum. For strong tones, colour both the back and the front of the vellum. The little test piece above was coloured with Stampin' Write Markers but similar results were obtained using Stampin' Blends alcohol markers. 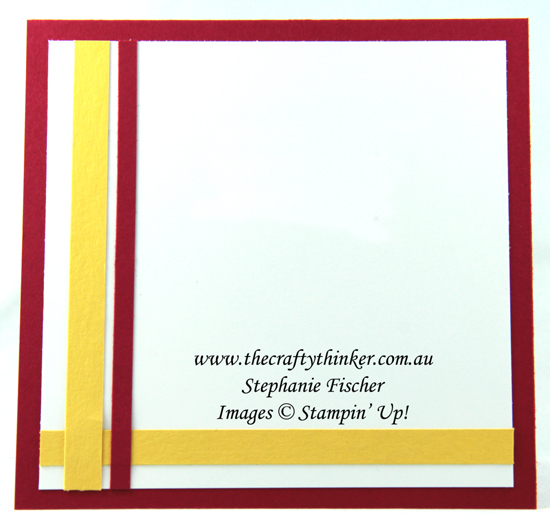 Having satiated my inner Modrian, I turned to this gorgeous flowy, wavy design in the pack and coloured it with Stampin' Blends. The greeting is stamped with Blueberry Bushel ink and I added some Faceted Dots. The card layers are Bermuda Bay, Whisper White and Blueberry Bushel. Waste not, want not - an off cut of coloured vellum makes a good decoration for the inside of the card! I decorated the inside of the card with an offcut of the coloured vellum.